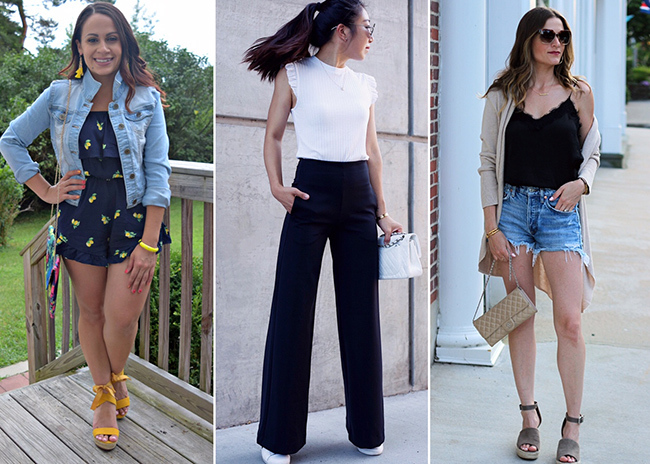 *Thank you to Lauren Ralph Lauren and Macy's (through Vayner Media) for sponsoring this post. All thoughts and opinions are my own. 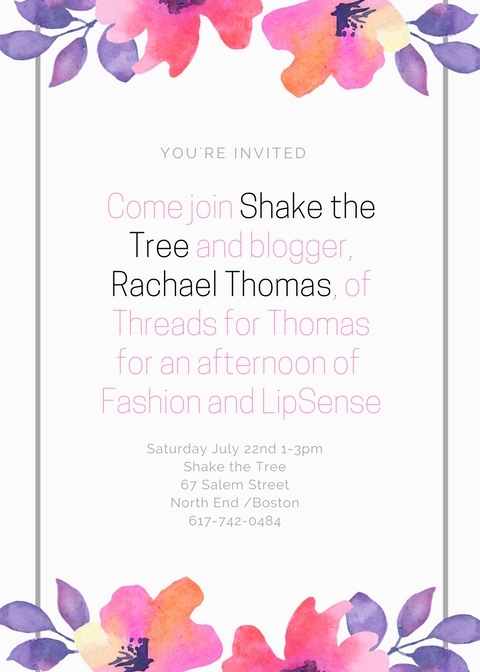 Thank you for supporting the brand that I love here on Threads for Thomas. 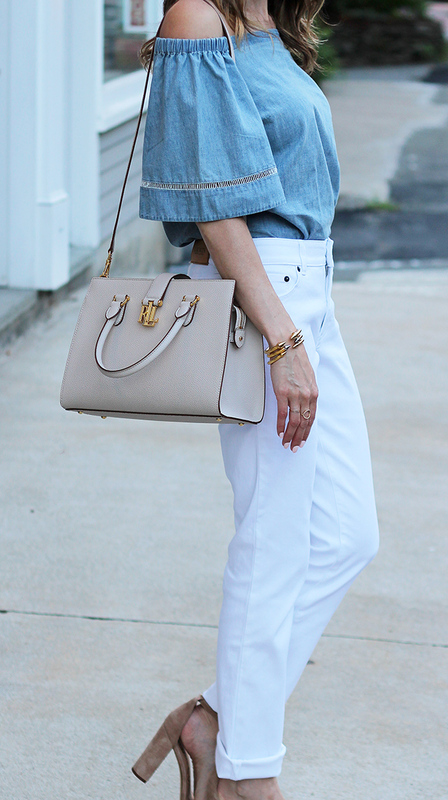 When I think of summer wardrobe staples, the first thing that comes to mind is a pair of white jeans and a chambray top. There is nothing more classic than a pair of white jeans, and I believe every woman should have a chambray top in her wardrobe. Although both items can be worn endless ways individually, there is something about the blue and white combo together that I just love. 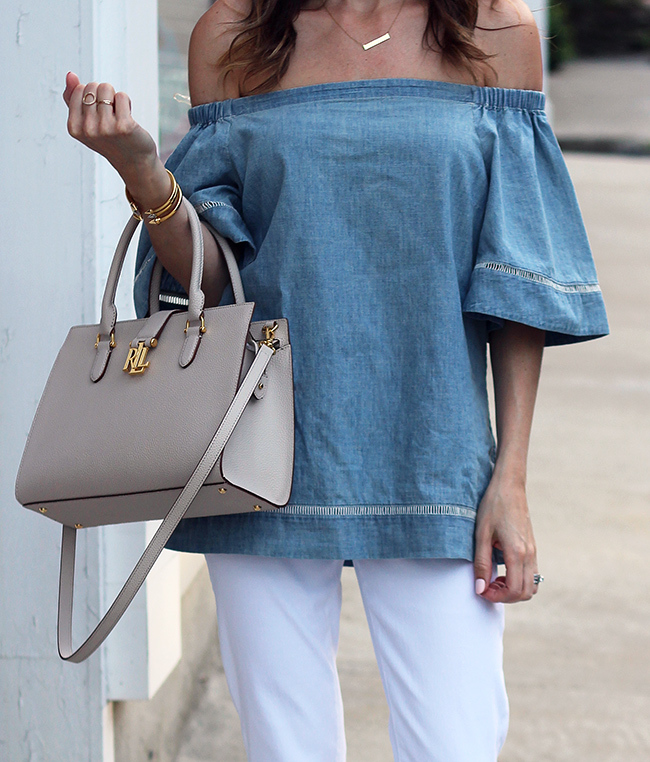 When I saw this chambray Lauren Ralph Lauren top, I knew I needed it in my closet. Not only was the chambray calling my name, but you all know that I'm a sucker for off-the-shoulder tops. It's exactly what I think of when I hear the Ralph Lauren name, classic, timeless yet stylish. I paired it with my Lauren Ralph Lauren white straight leg jeans, which are a nice change to the skinnies that I wear daily. I ordered these jeans in my normal size (4), which happened to be a little big. However, I decided to cuff them up, giving them a girlfriend feel, and love how it turned out. If you want these jeans to fit like a classic straight leg, make sure to order a size down. 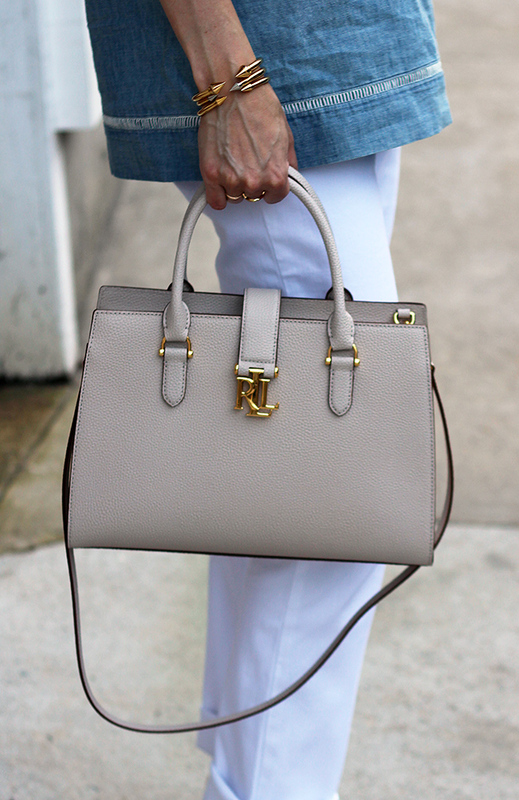 I finished my look with my Lauren Ralph Lauren satchel bag, which is my new obsession. I love the classic cut, gold hardware, and the size is perfect for everyday. I know I'll be using this bag for years to come. Although this chambray top is a great summer staple, you can bet that I'll be wearing it through the fall with a pair of black jeans and booties. That's the best thing about classics. The styling options are endless. I know what you all are thinking, Rach, why on earth are you wearing a sweater in the in the middle of July? You guys, it was only 58 degrees here in Boston this week, and I was NOT happy about it. On the bright side, it did give me the opportunity to break out some of my new fall clothing from the Nordstrom Anniversary Sale, and I was excited to sport this bell sleeve sweater. 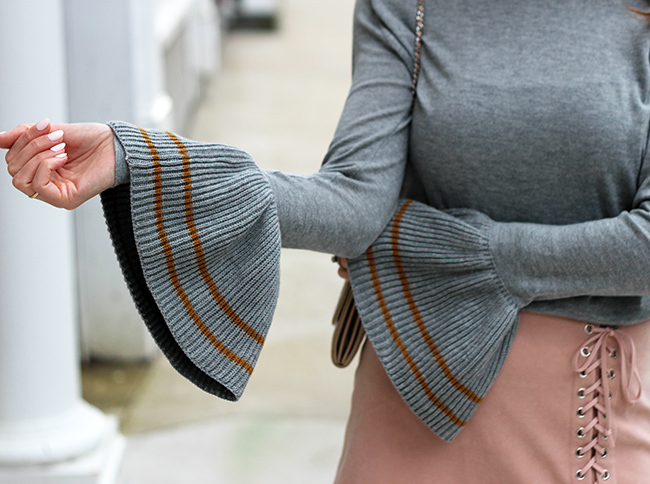 It's such a simple piece, yet the cuff bell sleeves gives it a dramatic feel. Unfortunately this sweater is already sold out in the grey, but I believe there are a couple of sizes left in the navy, and if it comes back in stock, I'll be the first to let you know! To keep my look on the lighter side (since it is still July), I paired my sweater with my blush lace up skirt ( I just love the look of blush and grey together), then finished my outfit with my Vince Camuto booties. These booties are perfect for transitioning into fall, and are included in the Nordstrom sale. They are available in three colors, under $100, and still in stock, so hurry. Don't worry, the warm weather has returned, and I'll be back to my summer posting next week. 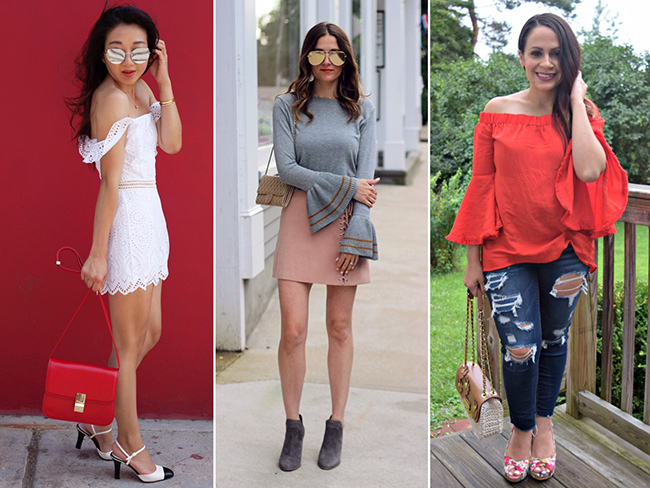 Although fall clothing is my favorite, I feel like summer just began, so my sweaters and boots can wait in my closet for a while longer! I know these Quay High Key Sunglasses are a little too big for my face, but I just love them so much, that I decided to wear them anyway. I have the hardest time finding aviators that look good on me, so I figured, these hide my dark circles and bags, so why not! I hope everyone has a great weekend, and don't forget to link up your looks below. The feature blogger is Christina of Memories of the Pacific. Not only am I in love with her kimono, but if you're heading to Madrid in the near future, make sure to check out her blog for some great shopping tips! One of my favorite places to shop for entertaining and home decor is at Nordstrom. Not only do I always find the cutest selection of throw pillows, but I love all the wall decor, and I never leave without finding a cheese board that I don't want to take home. 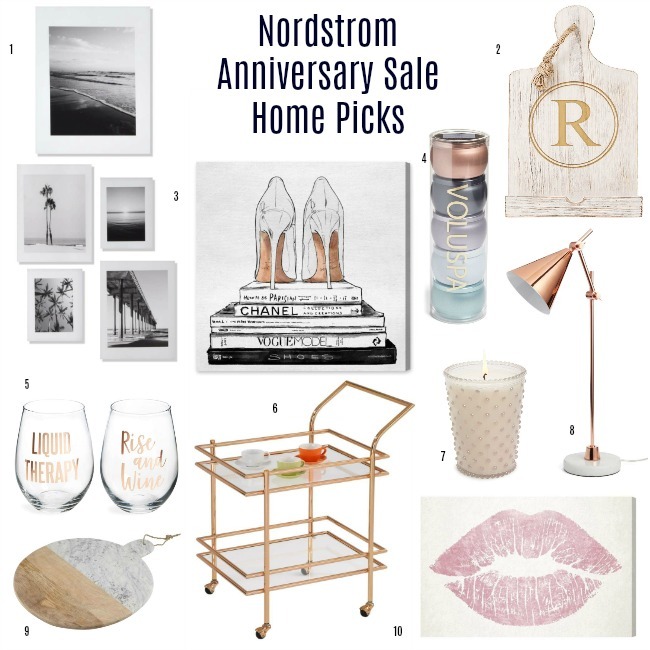 Today I'm rounding up my favorites from the Nordstrom Anniversary Sale for the home. I mean, how cute are these wine glasses, and I never say no to a pretty candle, especially when it's on sale! I am in love with this bar cart, and wishing I had someplace to put it in my house. Not only do I need this monogram book stand, but it would make a perfect hostess gift, along with these mini tin candles, and I'm thinking that I need to do some early holiday shopping! Have you bought anything from the Nordstrom Anniversary home sale yet? 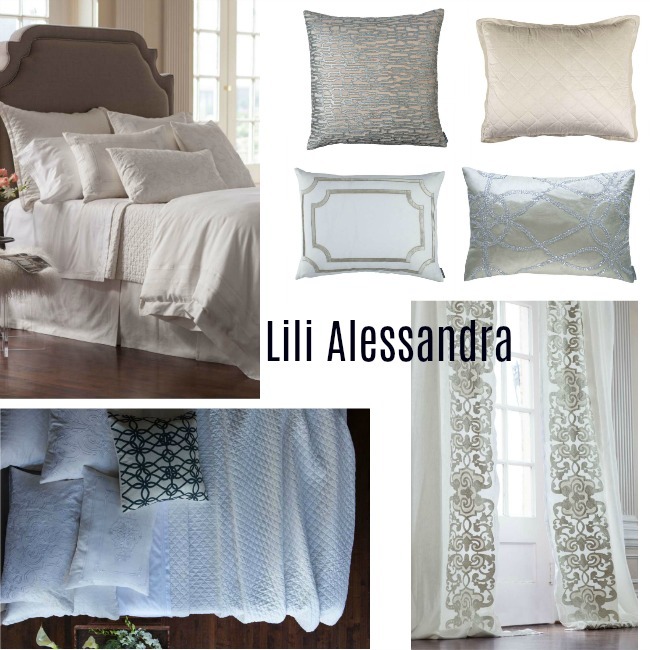 I was just recently introduced to Lili Alessandra bedding and linens, and I am in love with all of the intricate detailing. Lili Alessandra is now available at Nordstrom, and is included in the Anniversary Sale! Happy Sunday guys! I hope everyone is enjoying their weekend. 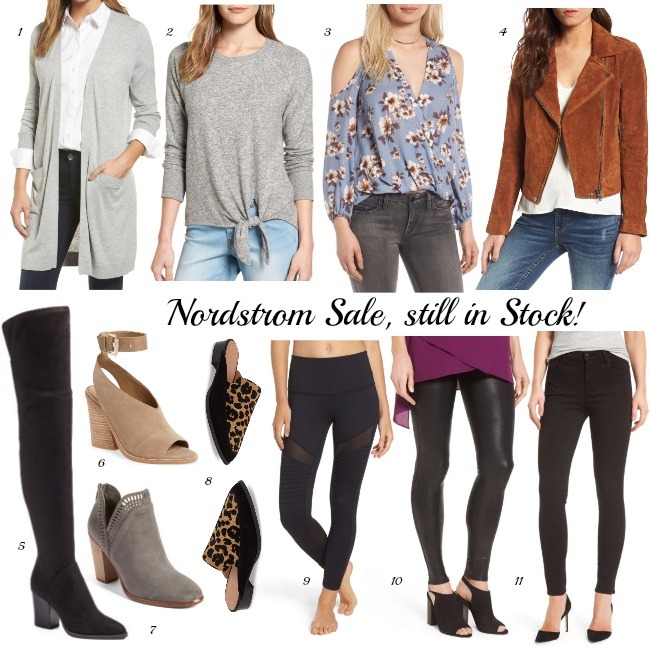 I know some of us are a little bummed because a lot of the items from Nordstrom Anniversary Sale have already been sold out, and not restocked (where is my blush sweater??). However, I re-shopped the sale online last night, and there is still a lot of great stuff available! I actually found things that I didn't see before, and lets just say my wallet isn't very happy with me. I ended up buying these Spanx faux leather leggings, which I know I'll live in this winter. They were a popular item last year, and I regretted not getting them. Some sizes are back ordered, but but they'll ship the first week of August, so I highly recommend snatching them up while they're still in stock! Also, the Blank NYC suede moto jacket, which is another must have, is still in stock in all sizes in the color spice. The burgundy keeps coming in and out of stock, so keep checking back. I'm so excited because two of my favorite jeans are included in the sale. These black JBrand Maria jeans are my go-to for a high rise clean black jean. I have been wearing them for years, and own them in multiple colors. Also these black distressed Citizens of Humanity Rocket jeans are another that I wear constantly. They have the perfect amount of distressing and a higher rise, which I love. Also the Free People plaid tunic, which was a favorite of mine, is still available in the blue color, and I'm thinking I now need to add that to my closet. I rounded up the rest of my sale picks below, and will keep you updated if any of my favorites that are sold out, become available again. Date night. Two words that aren't very common in my vocabulary. My husband and I set a goal this summer to find a trusty babysitter, so we can go on monthly date nights, but so far that hasn't happened. Since we don't eat dinner until after the twins go to bed, we make dinner our time, but it's not the same as getting out of the house and enjoying time between just the two of us. When we do finally get our act together and go on our date night, this is the outfit that I will wear. 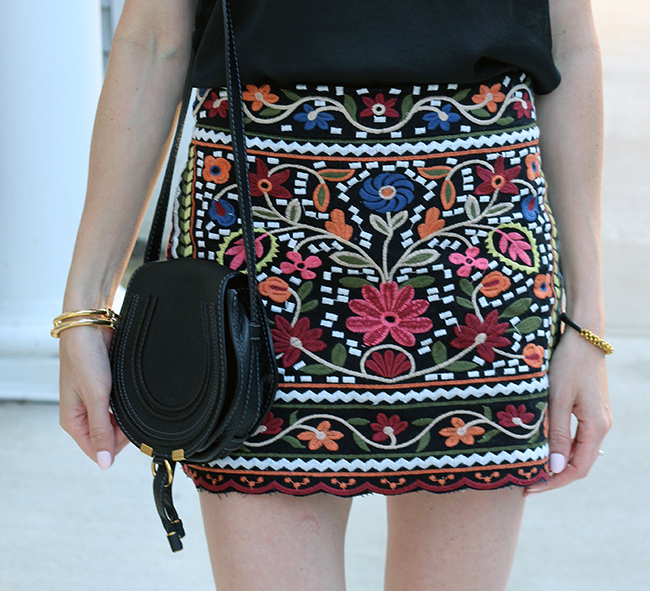 I recently got this embroidered skirt from Shein, and am obsessed! Embroidery is such a big trend this summer, and this skirt is a fun way to to bring it into your wardrobe. I paired it with my black BP. camisole, which is part of the Nordstrom Anniversary Sale. Unfortunately, it is already sold out in all three colors, but I'm guessing that it will be restocked soon, so make sure you snag one when they come back (I'll keep you updated on the restock)! I have been wearing mine nonstop, as it makes the perfect layering piece to any look. I finished my date night outfit with my favorite lace-up block heels, which are under $33, then added a lightweight jacket, since I'm always cold in restaurants. This jacket is from last year, but I've linked some similar options below. The good news is that we're only half way through the summer, so we still have time to find a sitter and start our date nights. Tell me, do you make time for date nights? Also, I'd love to hear some fun date night ideas!